Does lightning strike twice? Asus decided to revive the Eee brand to cash in on the revival of the good old Windows-based, Intel-powered personal computer. And the X205 might just be the ideal product for that. I had the privilege to review the original netbook eons ago. The Asus Eee PC single-handedly launched the netbook and whether people liked it or loathe it, it did provide the first truly portable and ultra-affordable computer, putting mobility in the hands of millions. Tablets have now superseded netbooks in terms of sales but Asus, with the EeeBook X205, thinks that a 2014 version, 7 years after the original one, is due. 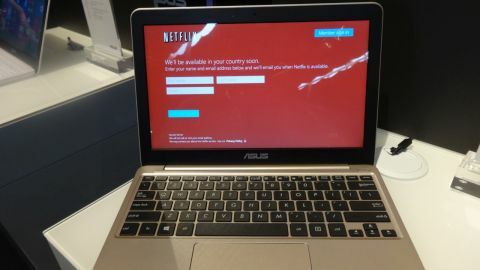 Asus adapted the current reference platform Intel and Microsoft have laid out for cheap tablets and laptops for the netbook platform, a form factor most, if not all other vendors have abandoned. What's on offer? There's a quad-core Intel Atom processor, the Z3735, which is also used in cheap tablets. There's 2GB of RAM, 32GB or 64GB SSD plus 500GB Asus WebStorage for two years (not sure whether you lose the data after two years or whether that stays up forever), an 11.6-inch display with a 1,366 x 768 pixel resolution, a webcam and a bigger than average touchpad. I have to say, I love the form factor, it's so portable, its light (at under 1Kg) and small (fits comfortably on an A4 sheet) and is about 1/3 the thickness of a standard paper ream. Asus opted for a matte plastic finish since it is, after all, a value product (although the official expression used by Asus, "chic," doesn't resonate with me). It will be available with Windows 8.1 with Bing and in four different colours - including the always fancy gold champagne. The keyboard is a bit cramped, as expected, however, Asus cleverly supersized the touchpad on the device; a small touchpad was one of the biggest bugbears that afflicted netbooks back in the days. There's a bit of flex on the keyboard and the keys are too springy to my taste and the touchpad feels too "plasticky" to the touch. But then again, it is an entry level laptop and input peripherals - as always - are very much a matter of taste. As for the display, it is bright and decent when viewed straight on. At 768p it provides sharper graphics thanks to a higher pixel density. Other things I noted during the brief hands-on: four massive rubber feet (bigger than average), a sealed battery (that can power the laptop for up to 12 hours, according to Asus), two USB ports, a microHDMI connector and a microSD card reader. The X205 got me excited again about the netbook form factor. Something's that designed, from the ground up, to bring mobility goodness and enhanced productivity to the masses rather than to a select few. At £169 (about $260, AU$280), I think that the X205 will be a decent seller for Asus and may well encourage other vendors to follow suit. However, Google, with the formidable Chromebook, cheap Windows 8 tablets and bigger, similarly priced laptops (often with twice the system memory and a proper keyboard and hard drive) will be potent challengers.